Did the orange work for you? The butterflies are pretty and I love the flowers. Gorgeous images.. Happy Sunday! A lovely montage of orange. 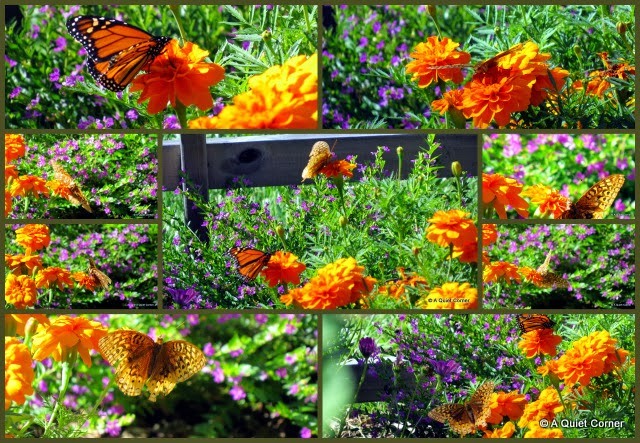 Orange is good, especially when it is attracting the butterflies. WOW!! this HAS to be prettier than the hummingbirds! Matching butterflies and flowers, how can it get any better than this. Orange is a great colour. Love the monarchs. I've read that they have managed to flourish this year, but I haven't seen too many of them. A wonderfully creative warm orange! I really like orange in gardens! Lots of orange goodness there. Nicely done.